Autumn is renowned for being careers fair season. Whether you are a graduate or more advanced in your career, careers fairs are a great way to discover new opportunities and to ask employers questions directly. If you come prepared, a careers fair can also significantly enhance your chances of gaining a job, as representatives of companies will be on the look out for potential recruits. To increase your chances, we have come up with our top tips to help you make a lasting impression. First and foremost, in order to get the most out of a careers fair you need to do a bit of introspection and understand what exactly you want to achieve from it. What types of roles are you looking for now? What is your 10-year career plan? What skills and experience do you have to offer? Based on our experience, the candidates who stand out from the crowd are those who come up to a stand and know exactly what they are looking for. It helps both the employer and candidate alike to find the right fit. Take a look at which companies are attending the fair, and which you find interesting. This information is normally available on the career fair website. Once you have made a shortlist, research your favourite companies and have a look at what types of jobs they offer. The main benefits of career fairs are that they give you the chance to ask employers questions directly, so make the most of it. Prepare a list of questions you want to ask each company– this could include questions about the business, the specific roles, what they look for in employees, progression opportunities and about the recruitment process. If a company you like the look of doesn’t have any relevant job openings, it might be worth asking them how often opportunities do become available. Prior to the event update your CV and print copies out ready to hand out. 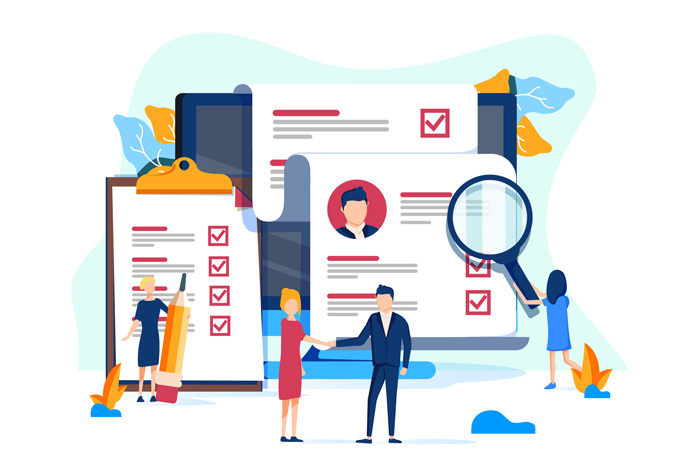 You could even go a step further and create some tailored CVs to specific job openings that you found during your research. On the day it’s advisable to dress professionally as if you were going to a job interview. And don’t forget to bring a notepad and pen to take notes. Exhibitors will have spent the day speaking to hundreds of candidates just like you. Make an impression and speak with confidence by preparing what you want to say in advance. Your pitch should be no longer than a minute long and should include a brief outline of your past experience and what you are looking for now. Be prepared with personal, sincere answers to questions the representatives are likely to ask you. These will most likely be centered around the kind of research you carry out, your technical skills and training and why you are interested in their company. On the day you will have a lot of talking to do in what seems like very little time. Use a map of the fair to plan your route, aiming to talk to the companies on your shortlist first and allowing enough time for questions and note-taking in between stands. If you plan on arriving early, this allows you to talk to your favourite employers before they get too busy. However, staying until the end also gives you the opportunity for more one-to-one conversations, after most other candidates have gone home. A good tip is to ask for business cards or write down the email addresses of the representatives you got on with the best. This allows you to have a direct way into the company when applying. However, once you have done the rounds and spoken to those companies which originally caught your eye, take the time to investigate other opportunities and ask questions to those you haven’t necessarily considered. You never know – the smaller, niche companies can sometimes surprise you! The careers fair is only the beginning. Afterwards take the time to follow-up with an email and a tailored copy of your CV to the representatives of your favourite companies. As mentioned before, this allows you to have a direct way into a company, sometimes allowing you to skip parts of the corporate application process.